19th Group Stage match of CLT20 2014 was played between Perth Scorchers vs Lahore Lions at M Chinnaswamy Stadium, Bangalore. 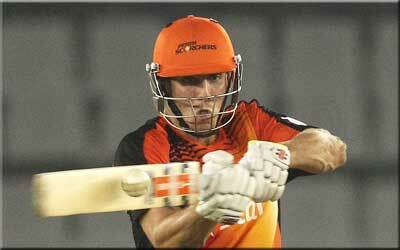 Perth Scorchers lifted possible win from Lions as MR Marsh (Perth Scorchers) played brave inning of 63* runs of 38 balls. He declared man of the match for his splendid inning. Earlier, Perth won the toss and decided to field first. Lions putting into bat first, could not made batter start in a cricual match and lost 4 wickets in just 11 runs. But Saad Nasim played sensible cricket in middle and contributed 69 runs of 55 balls and put Loins on respectable score of 124 runs at the end of 20 overs. Following small target of 125 runs, PeErth also could not made batter start and lost 2 wickets in 2 runs. Other top order batsmen also failed today and at one stage Perth were 4/27 in 5 overs. MR Marsh (Perth Scorchers) declared man of the match for his good peace of batting with 63* runs of 38 balls.